WATCH A SLOW MOTION VIDEO! GET THE HOOK & GO AHEAD WITH NEW TRICKS! Innovative gadget gives us a totally unique view of the kiteboarding world. Watch the video, filmed by the new flying camera and see the kiteboarding world in a new and intereting way. Lives: Now in Playa del carmen, Mexico.. For several years as growing, I been moving around of the Caribbean sea in Mexico. –Kiteboarding: I got inspired to the sport when the crew of Realkiteboarding came to visit the island of cozumel. after that..I start & stop several times as well, part of the main reason was of not having the right gear, the wind condition were short seasons, or some other inconveniences that I couldn’t easy just get into the water and go riding.. I was just watching instructors videos of kite… until 2007 I finally got my gear set, and 2008 I move to Dominican Republic to get better at it, no longer of 3 days I start improving … DR knowing for best spot for kiting, visiting before for short holidays. In there I dedicated so much more to the sport… participating in a trip for 3 days and been part of the film secret spots in DR with the crew Starkites. In middle of 2009 I start traveling around searching for new spots with wind in panama. where later on I could mix the two sports depending on the weather conditions. I try to train in DR for the race competition, for the PKRA, but there were no race competition at the time. The whole story chance when I arrive the 1st night at extreme hotel, I got robe after that getting into very disturbing experience with a robbery & legal process, I lost all the concentration for training, I focus more on paints for work, and staying in there until everything got resolve, the history and up me leaving the country and the girl getting out of jail. not a cool history, sorry about that, but regards of adding this information, I meet as well wonderful people that help me in the way! and now good friends. During the legal process, I won the contest with the Aboards. I realized this sport now is part of my life style. I have the skills and abilities as surfing, and with better luck and more time in the water things could work out much better. However is has give me a good experience of life, stronger mind. more careful in my travels. I lost the motivation to train for a competition, I try for life! Jeje:) I enjoy extreme sports!! !..pure adrenaline!! Looking forward to new spots in South America! Favorite tricks: Grabs, I like to jump high…and try moves that comes natural. What motivates you: The ocean, The Nature, The sunrise & sunsets, Music, surrounding myself with loving and kind friends, I get inspired with artist and talent it people. what else inspired me: (?) God, enjoying life, being a good human, being healthy, Extreme sports, Adrenaline, Art. Lesson of life: jejeje to laugh, to be happy, to share, to love, to think positive, what doesn’t kills you makes you stronger, and there is a positive lesson experience behind any adversity, to be grateful and thankful, to do the best you can, even that you best will be always changing, still try your best!. that I am very lucky in life I had meet so many wonderful people some now friends, in my travels. to be cheerful!!. I belive in magic. jejeje, there is good humans being in the world. I try to surround myself with them. if I am not. I pride!!:). life is great!!! Favorite food: Mmm right now I will say Mexican food! hehehe when I not in diet, I like healthy & natural food, veggies, and create in every meal a fusion of cultural recipe…salads, pastas, sushi.. Italian, oriental, mediterrane…mmm I am getting hungry just think about it! hehehe. I like to try a little bite of the place I travel or visit, and eat the local fruit from the place. Music you like: soul music…all general music, it will all depends in the occasions! Other hobbies: yoga as a daily life discipline, beside board sports as waveboard; capoeira, jugging, swimming, diving, rollerblade, bicycle,claming, skydiving. New video from champion of Ukraine and pro rider Andrey Salnik riding his 2010 X-series boards from ABoards Kiteboarding. Sit back and enjoy. All winners will be contacted by ABoards directly via email to arrange the sizing and shipping details. 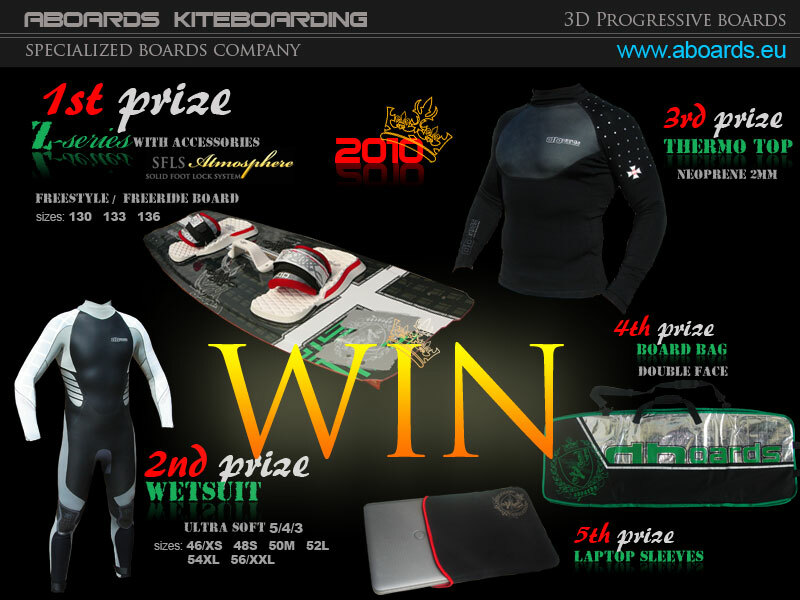 ABoards Kiteboarding has launched a new section in our company website that opens up a whole new world of friends and possibilities world wide http://www.aboards.eu/public/?Dealers:Facebook&normal. Links to individual Facebook profiles, groups and fan pages of our distributors and dealers are presented to help you in finding your kite friends worldwide, share you experiences, photos, videos and best riding moments. The new section will also allow you to follow the latest product developments and get in touch with your local representative of ABoards even faster and easier. More updates are coming soon. Stay tuned!